Publication Information: Crown Publishers. 2013. 429 pages. Book Source: I received this book through the LibraryThing Early Reviewers program free of cost in exchange for an honest review. The book came as a paperback advance uncorrected proof. Favorite Quote: "What was it about death in the United States? Why did it seem like American were so unprepared for it when it occurred? .... People often did not want to talk about death with the dying, or be there with a relative when it happened. Why did we celebrate every milestone in life except this one? Everyone wanted to be there to witness the beginning of life, but the ration of birth to death was one to one. We all had to learn to say good-bye and give our loved ones the dignity to acknowledge we knew they were going." Five Days at Memorial brings to life the events at Memorial Medical Center in New Orleans in the five days following Hurricane Katrina in 2005 and the philosophical, moral, ethical and legal battle that ensued after. In the aftermath of Hurricane Katrina, about 2,000 patients were evacuated from Memorial Medical Center, and over 45 bodies were found at the hospital. Several of the deceased were found to have large doses of pain medications in their system - doses large enough to be lethal. It was alleged that the doctors at Memorial, Dr. Anna Pou in particular, had euthanized patients. In 2006, a case was brought to the grand jury against Dr. Pou. After months of investigation, the grand jury failed to indite. This book documents these in two distinct portions. The first is a reconstructed story of those five days - the water, the lack of sanitation and power, the evacuations, the decisions as to which patients could not be evacuated. The second part begins with the initial inklings that the decisions made at Memorial may not have been in the best interests of the patients. It takes the reader through the details of the ensuing investigation, the charges to the grand jury, and the ultimate decision of the grand jury to not indite. The final few pages present the reaction of different people involved to the grand jury decision. Sheri Fink is a Pulitzer prize winning journalist. She brings those investigative skills to this book. In the author's note, she points out that the research for the book took place over the course of two years and included over 500 interviews. The biggest issue with the book is its length and the extreme detail included. The book itself begins with a five page long list of "selected individuals" who are part of this history. I found myself sometimes getting lost in who the people were and then getting mired down in the details. Eventually, I found myself skimming through the details to follow the main thread of the investigation. Publication Information: Houghton Mifflin Harcourt Publishing Company. 2012. 326 pages. Book Source: I received this book through the GoodReads First Reads program free of cost in exchange for an honest review. The book came as a hardcover edition. Favorite Quote: "Somewhere along the way, we all want to - or at least try to - figure out why we're here and what all the [****] it means, you know? I was ... confirming a few things for myself, starting with the fact that I didn't have to figure out what to do with my life. I was doing it." My Mother Was Nuts is Penny Marshall's memoir, starting in her childhood and going through almost the present. She starts with the fact that she was an unwanted child. She talks about her childhood in the Bronx, her pregnancy and her daughter, her marriages, her abortion, her bout with cancer, and, of course, the trajectory of her amazing career. I grew up watching Penny Marshall - from cameos on The Odd Couple, Mary Tyler Moore, and Happy Days to Laverne and Shirley. Her movie Big is one of my all time favorite movies. I came to this memoir expecting to find the same humor and joy as I find in her work. I did not. I am not sure whether that is because, of course, life and the movies is not TV, or because I watched those shows with the eyes of a child and now as an adult, it does not hold the same appeal. For me, this book has a sad undertone running throughout. It starts at the beginning with her mother stating, "You were a miscarriage, but you were stubborn and held on." She refers to her grandmother as "our building's witch lady." About her divorce from Rob Reiner, she say "Maybe, though, in the end, I did make him sick." In the dedication, the end of the book, the acknowledgements, Penny Marshall credits the people in her life as what she treasures the most and the the fact that "I've been given my five minutes ... and then some." This tribute seems somewhat inconsistent with the sad, sometimes negative thoughts through out the book. That's family reality, I suppose - the good and the bad and that you can't take one without the other. I, however, cannot shake the sadness of some of what she describes and how she describes it. Publication Information: AmazonCrossing. 2013. 395 pages. Favorite Quote: "What was all this fuss about religion? Surely, she though, religion should be practiced without thought of race or color, with all its ceremonies carried out in mosques, churches, and synagogues. God was worshiped in these communities, and people reached out to Him and found peace in their souls ... Yes, religion was a many splendored thing; surely it should be a part of life and not used to separate people?" 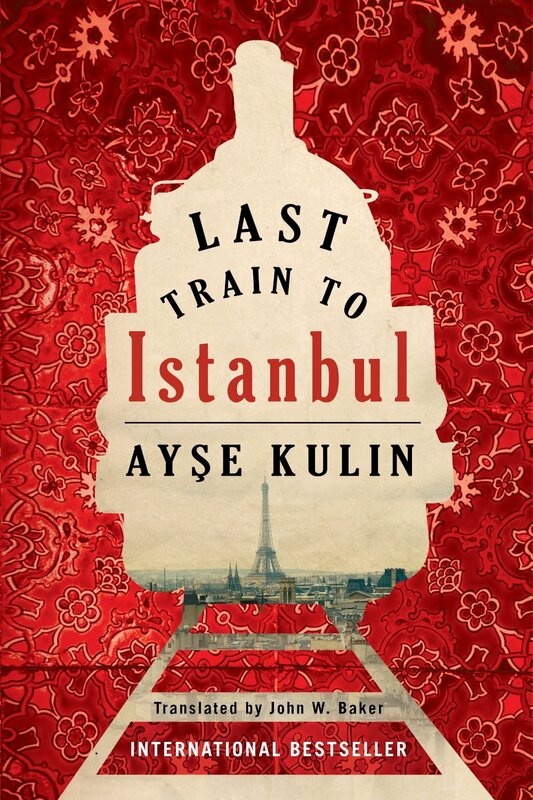 The Last Train to Istanbul is a story of World War II - in particular the Turkish community in Europe at the time of the war. Originally published in Turkish in 2002, the book has now been translated into English. At the heart of the story is one family, descendants of the Ottoman emperors of Turkey. The parents give their daughters an education and liberty yet hold fast to traditional values. One daughter, Sabiha, follows that traditional path and marries an eligible young man and becomes a diplomat's wife. The other daughter Selva chooses a different path and marries out of the faith. Selva is Muslim, and Rafael is Jewish. Selva and Rafael marry against both families' wishes and flee to France to build a new life. Then comes the Nazi invasion of France and the hunting down of Jewish residents. Selva and Rafael search for safety and learn that family comes together regardless of the disapproval of their choices. Through connections and the work of a group of Turkish diplomats in Europe, the two along with many others escape towards freedom. The book is historical fiction - the history providing the story and the fiction providing the emotional basis. The book goes more on the side of history than the emotions of the individual characters and this family. Their characters and relationship do not fully develop. The characters remain a piece of the history being told, rather than the history becoming a backdrop for the story of this family. As such, the book is interesting to read, but an emotional detachment remains. That detachment makes it a less engaging book. Publication Information: John Wiley & Sons, Inc. 2012. 384 pages. Book Source: I found this book while browsing the online catalog for my local library. Favorite Quote: "In the end, the real answers always come from trying, experimenting, and answering this question for yourself: What would happen if.....?" Digital Photography FAQs is a daybook for photographers. It is structured in a question and answer format with a total of 365 questions. The questions are categorized as follows: camera and gear, basic photography techniques, lenses and accessories, and creative shooting techniques. It is aimed towards a beginner photographer. The positive aspects of this book are that it provides succinct, high-level answers to basic photography questions. As such, it can be a good introduction to the topic. The book also includes photographs that illustrate the questions and topics being addressed. Having a visual reference certainly makes a concept easier to understand. I read this as an ebook edition. I think this book would be better suited to a print edition. The ebook edition, perhaps because of the graphics, takes a long time to load and move through pages. The biggest issue with this book is the lack of organization and tools that would allow the book to be used as a true reference. Beyond the four main categories, the book has no other organization. The book includes no topical index. The individual questions within each section are not in any particular order. The author even says, "These are delivered in no particular order, so if you're a flip-though-the-pages kind of reader, like me, the format of this book will appeal to you." I suppose I am not that kind of reader, as the format does not appeal to me. Publication Information: Gallery Books. 2013. 336 pages. Book Source: I received this book as a galley from the publisher for an honest review. The book came as an ebook edition. Favorite Quote: "I find that the thoughts spoken between the lines are the most important parts of a poem or story." Mrs. Poe is the story of Edgar Allen Poe, his wife Virginia, and Frances Sargent Osgood, a poet and children's author some say was involved with Edgar Allen Poe. She is known to have exchanged flirtatious letters through the Poe's literary journal. Historically, it is uncertain whether the two actually had a love affair. The story begins shortly after the release of Edgar Allen Poe's poem The Raven, which has become the rage of New York. Virginia is Edgar's first cousin and also his very young, very ill wife. Frances "Fanny" Osgood is a struggling writer, who has been abandoned by her husband. She lives with friends and attempts to make a life for herself and her two young daughters. Edgar and Fanny meet at an evening literary soiree. The friendship and attraction develops, as does a friendship between Frances and Virginia. The book proceeds on with numerous meetings between the two and all three of them. Repeatedly, Edgar and Frances stop short of taking their relationship further - out of concern for his wife, out of concern for her children, and out of concern for what people will say. Each time, the relationship goes a little bit further regardless of those concerns and regardless of the warnings of those around them. Added to this is the role of Virginia's mother "Muddy" Clemm and the return of Frances' husband. The relationship and the word play continue between all those involved. The relationship builds and has ramifications for all those involved. The ending of the book moves forward and tells the reader what eventually happened to these individuals. A sad ending indeed. I am familiar with Edgar Allen Poe, of course, but prior to reading this book, was not familiar with the rest of the main characters. I have not read anything previously about his life. It is an intriguing though sad story. It also includes some of the dark tones of Edgar Allen Poe's works - dramatic incidents to try and keep Edgar and Fanny apart. The book falls a little short for me because it becomes a little repetitive. The nature of the relationship between Edgar Allen Poe and Fanny is that they meet; they feel a connection; they retreat due to societal bounds. They meet; the connection continues; they retreat. The focus of the book remains this interaction and not the development of the characters. This repetitive nature makes the book somewhat slow reading at times. The book is, however, an interesting snapshot of a time and a place. The book references so many others of the literary and art community of New York at the time. I cannot vouch for the historical accuracy, but it's fun to read about characters such as Louisa May Alcott, Phineas Barnum, William Bryant, and Henry Wadsworth Longfellow. Publication Information: Harper. 2013. 384 pages. Book Source: I read this book based on how much I enjoyed another book (We Need to Talk About Kevin) by the same author. Favorite Quote: "The most sumptuous experience of ingestion is in-between: remembering the last bite and looking forward to the next one." Big Brother is a book about a dysfunctional family and about obesity. Pandora lives in Iowa with her husband, Fletcher, and her two stepchildren. Edison is Pandora's brother. Pandora owns a business that makes custom dolls. People send in a picture of a loved one and a set of phrases or comments that the person repetitively says. Pandora's company embodies those in a doll. (Not something I would want and just a little bit creepy, in my opinion). Fletcher makes furniture that no one buys. Edison is a jazz pianist whose is down on his luck. Also included are memories of Pandora and Edison's unusual childhood. Pandora sends Fletcher a ticket for a visit out to Iowa. She and the entire family is shocked when Fletcher arrives. He has changed considerably since they last saw him. He is morbidly obese with habits that disgust the family and those around him. Pandora takes it upon herself to help her brother lose weight. She leaves her family and moves into an apartment with Fletcher. They spend months turning his life and his weight around. At the end, however, a whole other twist is revealed. Ostensibly, the book is a statement on obesity and its impact. That purpose, for me, was lost. For me, it's a story full of odd unlikable characters and an ending that leaves me with the reaction, "I read almost 400 pages for this. Why did I bother?" If you decide to read this book, do not read other reviews before hand. Most of them have spoilers. Then again, if I had read the spoiler, I probably would not have read the book.